In order to deploy your Angular JS applications in a standard and well structured manner, you need Yeoman angular generator. It is a project generator for angular applications; it easily manages packages, project structure, directories etc. The working of this tool is simple, install it and start deploying your Angular applications easily using a single command. If you are want to know more about these two components, check out related article. 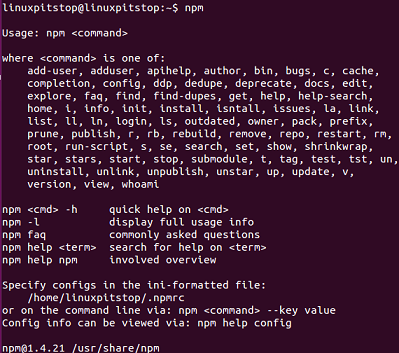 Run “npm” command on the terminal to see more about its available command line options. That’s all, we are ready to install Yeoman angular generator now. Run following npm command to install it on your Ubuntu system. It will take a sweet amount of time to complete the installation. As soon as the installation is over, start deploying your Angular Apps by using the following syntax. Replace APPNAME with the name of your application. Due to the popularity of Angular applications, you might find some more applications of the same nature as Yeoman, but its totally matter of preference as which tool to use to deploy your angular programs. Yeoman is pretty easy and most widely used.